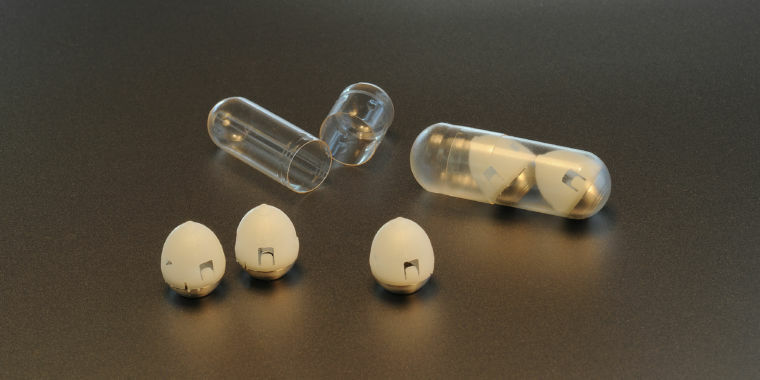 Enlarge / Self-righting capsule orients itself in the gastric cavity and delivers biologic molecules to the tissue wall. If the sight of a doctor flicking a needle makes you cringe, you may be better off going with your gut, according to a team of researchers at MIT and Harvard. The team is working to knock out the need for painful, anxiety-inducing shots by having patients gulp a pill instead. But not just any pill, but an autonomous one that can right itself in your gut while packing a tiny, spring-loaded shot of drugs that it then injects directly into the thick wall of your stomach. The painless prick could deliver therapeutic payloads that normally wouldn’t survive the harsh, acidic environment of the stomach. By doing so, it would make life a lot easier for needle-fearing patients and for those who depend on frequent drug injections, such as people with diabetes who take daily insulin shots, the researchers say. In a report in the February 8 issue of Science, the researchers reveal a prototype of their autonomous pill along with positive results from tests in pig stomachs where they tried delivering insulin. While the research is still in the very early stages, the data so far hints that their self-righting pill—about the size of a pea—could one day work in patients. “The drug delivery efficacy achieved with this technology suggests that this method could supplant subcutaneous injections for insulin and justifies further evaluation for other biomacromolecules,” the researchers concluded. To come up with their prototype, the researchers cribbed the wobbly, self-orienting design from the leopard tortoise. The reptiles’ knobby shells help them roll out of life-threatening danger when they find themselves upside down. Taking the basic idea, the researchers engineered a capsule, vaguely acorn shaped, that will teeter to an upright position from any other position. leopard tortoise, localizes to the stomach lining, self-rights, and inserts drug into the tissue wall. Imaging at 1,000 frames per second reveals that the pill, made from a mixture of PCL and stainless steel, self-orients. Imaging of insulin insertion in a pig’s stomach. For safe ingestion, the researchers made the capsule out of a biodegradable polyester already approved for medical devices and drug delivery—polycaprolactone (PCL)—as well as stainless steel, which had also already been safety tested for use in dental braces. Then, they kept the knobbed shell empty to load it up with drugs. In the first tests, the researchers tried delivering insulin. 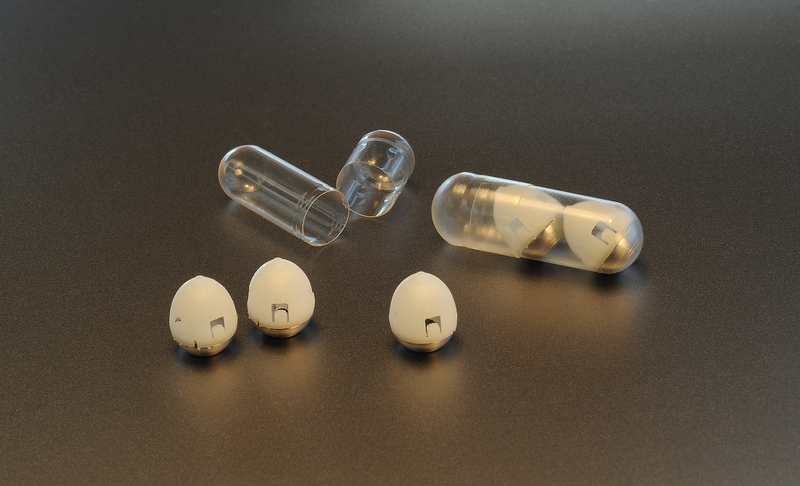 They engineered the capsule to have a spring-loaded, 1.7-millimeter needle, made of compacted, dried insulin. The compressed spring sits at the top of the knob with a vent to the outside world. It’s fixed in place with caramelized sugar, which dissolves on exposure to stomach acid, unleashing the spring and the drug spike. And because the capsule is self-orienting, the shot of drug is set up to fire directly into the 4mm- to 6mm-wall of the stomach, which has no pain receptors. In tests in pigs, the pokey pill successfully delivered a gut punch, even when the researchers tilted and rotated the animals. The pigs’ blood-sugar levels went down, suggesting that insulin delivery worked. Further testing showed that the insulin was shelf stable for 16 weeks, and the researchers saw no evidence of damage or perforation of the pig’s stomachs. But there was one big hiccup—one that’s a bit hard to swallow. The pill only worked when the animals were fasting. If they had food or liquid in their tummies, the pill didn’t work. The researchers suggest that the failure may be due to food particles and other gunk clogging up the capsule’s vent, thus preventing the spring from firing. They designed a valved silicone membrane to try to prevent that, but the capsule will need far more testing. Further testing should also address if repeated or daily gut pricks could lead to inflammation or injury, the researchers note. “Still, the [pill] represents a platform with the potential to deliver a broad range of biologic drugs, including but not limited to other protein- and nucleic acid–based therapies,” the researchers conclude. Science, 2018. DOI: 10.1126/science.aau2277 (About DOIs).